Chagas disease is a neglected illness affecting approximately 10 million people in the Americas, caused by a parasitic microorganism called Trypanosoma cruzi. There are only two drugs used against Chagas disease, which are effective only in the first moths of the infection. After this period, without possible treatment, patients slowly develop severe heart and gastrointestinal injuries, dying suddenly after several years of organ malfunction. Fig. 1. A) Red grapes, one of the main sources of resveratrol. 2) Resveratrol molecule (3,5,4′-trihydroxy- trans-stilbene) is a type of natural phenol used as antioxidant in humans. C) Arginine kinase structure (purple) highlighting the inhibition by resveratrol (blue) that binds in the enzyme active site. D) Different forms of Trypanosoma cruzi, which are killed by arginine kinase inhibition with resveratrol. Therefore, discovery of new drugs is an urgent need, and those drugs must kill the parasite without affecting the patients. In this work we looked for new drugs to attack a metabolic enzyme of Trypanosoma cruzi, namely arginine kinase, which is essential for parasites survival and is absent in humans, making it the perfect target. First we took a list of natural compounds produced by plants, called polyphenols in hope of finding one of them being able to kill the parasite. Then we used computers to model if those compounds can attack the enzyme by blocking its active site (where the enzyme does its job), like testing several keys in a keyhole to see which ones fit and jam the lock. Many of the tested compounds jammed the enzyme in the models, but one of them, called resveratrol, drew our attention. Resveratrol is a natural antioxidant found in red grapes (and red wine), peanut butter and dark chocolate. It is a dietary supplement available in any pharmacy, it is completely non-toxic and is easily accessible due to its low market price. We tested resveratrol in the laboratory to see if was able to jam the active site of the enzyme, inhibiting it. For that we tested the action of the enzyme and proved that its activity was lower as more resveratrol we added to it. We switched then to test resveratrol in live parasites to see whatever effect it could have. 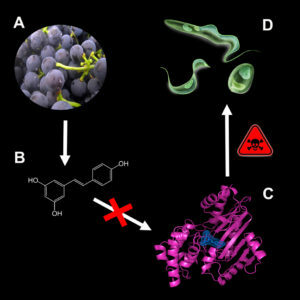 We found that low quantities of resveratrol are able to kill the Trypanosoma cruzi in laboratory cultures, and this killing effect is greater in the form of the parasite that infect humans and other mammals, in comparison with the form that is carried by its transmission insect. Summarizing, in this paper we identified a natural product non-toxic for humans that is able to kill the parasite that causes Chagas disease by inhibiting the enzyme arginine kinase. Currently, resveratrol is being tested in mice infected with Trypanosoma cruzi and, if the results are promising, this drug could be rapidly implemented in the treatment of Chagas disease. 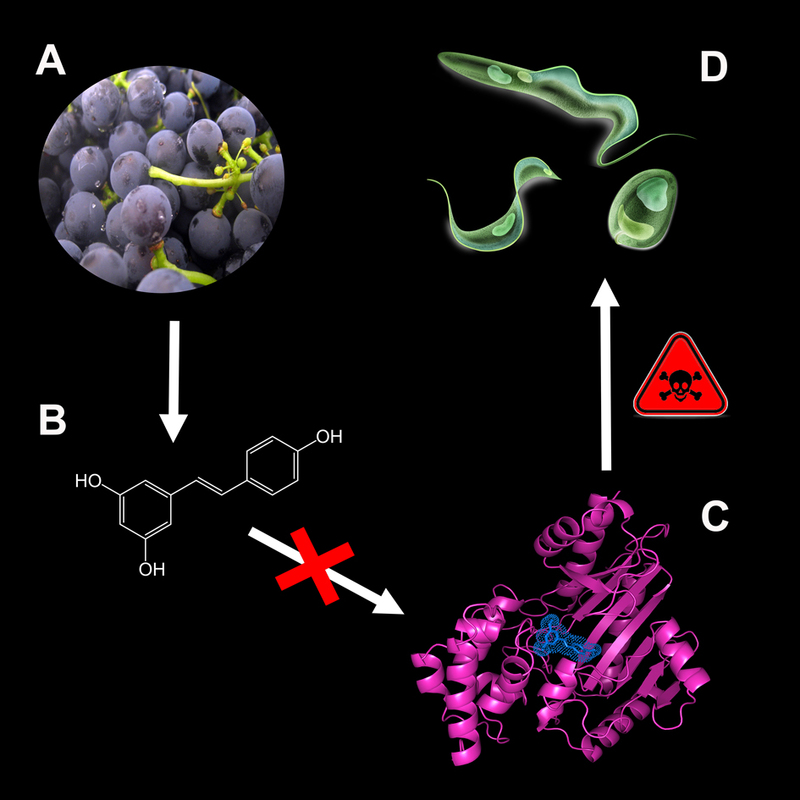 Resveratrol inhibits Trypanosoma cruzi arginine kinase and exerts a trypanocidal activity.